Our SNAP and SAP laboratory panels, offered in cooperation with Vinquiry in Windsor, have been very successful for the last several years. But sometimes it’s fun to do your own testing. Or maybe you live too far away to take advantage of SAP and SNAP. There really is no equivalent home test for the “N”—nitrogen—in SNAP. But the SAP Tests—sugar, acid, and pH—are readily addressable with home testing techniques. For the 2006 harvest, my wife Marty White and I decided to give several home kits and techniques a try. We used the SAP panel from Vinquiry as our reference and ran our own tests to match on our home-grown pinot noir and chardonnay. We did not have the Vinquiry results in hand prior to running our own tests. In the interest of full disclosure, I should note that both Marty and I have bachelor’s degrees in chemistry and she also has a master’s in chemical engineering, but no such education is needed for Beverage People test kits! The harvest home test for sugar is a brix refractometer, which is the same instrument Vinquiry uses (although theirs is digital and ours is analog). We crushed the pinot noir grapes and stirred the must before taking a sample with a thief. We crushed, soaked up, and pressed the chardonnay before taking that juice sample. (The split samples for Vinquiry were collected at the same time.) 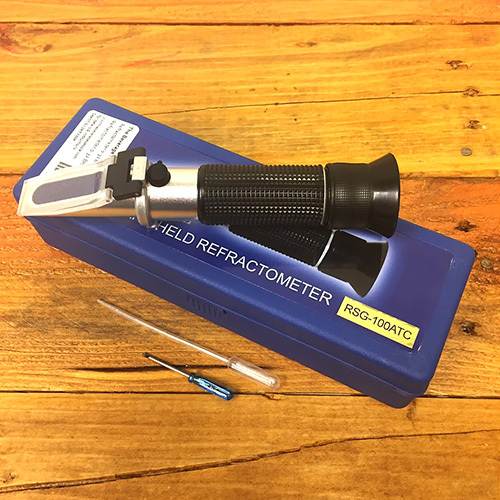 Use of the refractometer is very easy. First, it is calibrated with a few drops of 20 degree brix reference solution. Then it is rinsed with distilled water, and a few drops of grape juice are placed on the prism. Our results were 24.2 brix for the chardonnay and 26.0 brix for the pinot noir. Vinquiry said 24.1 for chardonnay and a matching 26.0 for the pinot. Conclusion: using a refractometer at home can provide very reliable harvest sugar readings. Vinquiry uses a sophisticated autotitrator to execute the traditional winemaking method for Titratable Acidity. They report in grams per 100 milliliters—roughly equivalent to percent. The lab results on our juice samples came in at 0.809 grams per 100 mL on the Chardonnay and 0.760 on the pinot. At The Beverage People, we offer three home tests for TA. The most popular is the little Country Wines titration kit with its phenolphthalein indicator and sodium hydroxide titrating solution. This is based on the primary lab procedure for the same test. Executed carefully at the kitchen table, it gave us a result of 0.81 on the chardonnay and 0.62 on the pinot noir. The close correlation on the white juice (and less success on the red) probably reflects the difficulty of seeing the pink endpoint in the grayish-pink “red” must. Next, we tried the Precision Acidometer. This kit includes a blue indicating solution which is itself also the basic titrating material for neutralizing the acid during analysis. The first few additions, still reflecting acid conditions in the juice, turn green. As you continue to add, the solution is neutralized when it is (not quite) blue—almost the same color as the indicator solution alone. Since this has the “not quite” feature, it’s a good idea to write down your results as you get close, since you will mostly know for sure right after you go too far. The kit also includes litmus paper to verify the neutrality of the titrated sample. If a drop on the litmus paper turns red, it is still acid. No color change means neutral (the end point) and blue means basic—you went too far with that addition. With the green-to-blue color change and litmus paper for verification, the endpoint seems a little easier to pin down than the Country Wines endpoint. With this kit, results are in grams per liter, so you need to divide by 10 to match the reporting units by other methods. For the chardonnay, we got 7.9 (0.79) and for the pinot noir 6.8 (0.68). Both are close enough to Vinquiry’s results that we would probably not do anything different in fermenting the wine based on these answers. Finally, we ran the simplest of the tests, the Accuvin dipsticks. Once again reporting in grams per liter, we got 9 (0.9) on both samples. Good enough to tell us that we did not need to add any acid to these juices, but that’s about all the information we got. Vinquiry uses a pH meter integrated with their autotitrator for this test. Laboratory results were 3.38 for the chardonnay and 3.43 for the pinot noir. Using the pH Tester 20 meter that we carry at The Beverage People, Marty and I measured 3.32 on the chardonnay and 3.36 on the pinot. At less than one tenth of a pH unit difference on each, these results are very comparable and the home results are certainly adequate for winemaking judgments. Accuvin also has a dipstick test for pH. On those, we measured 3.6 for both juices. While in the ballpark of anticipated results, these may not be accurate enough for all winemaking decisions. The procedure is, however, simple and inexpensive. No matter what you choose, TA is difficult to do well at home. Both Country Wines and Precision Acidometer can give reasonably good results, but the commercial testing laboratory has a clear advantage on this test. For Brix and pH, properly calibrated home equipment gives results virtually identical to laboratory results. Quick tests do not measure up to the precision and accuracy of analytical instruments. The sticks provide reasonable estimates, but to duplicate laboratory quality work at home requires more sophisticated techniques.